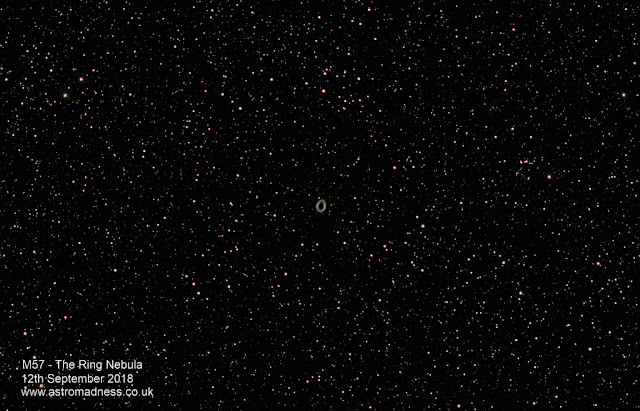 M57 - The Ring Nebula, and the story behind the image. Every image has a story. Be it about the subject itself, the location or how the image was obtained. This image represents for me 2 things. Firstly, proof that not all astrophotography images are about full frame objects, or targets cropped within nanometres of their boarders. An impressive planetary nebula nestled in amongst a field of view littered with stars, M57 is amongst the smallest targets out there to image, so getting any detail in it at all can take some effort. Secondly though, the image has taught me a lesson. One that I hope will now significantly improve all my future images taken with the Hypercam 183c. More on that in a moment. My last post set out the process I go through to collect the data for my images. 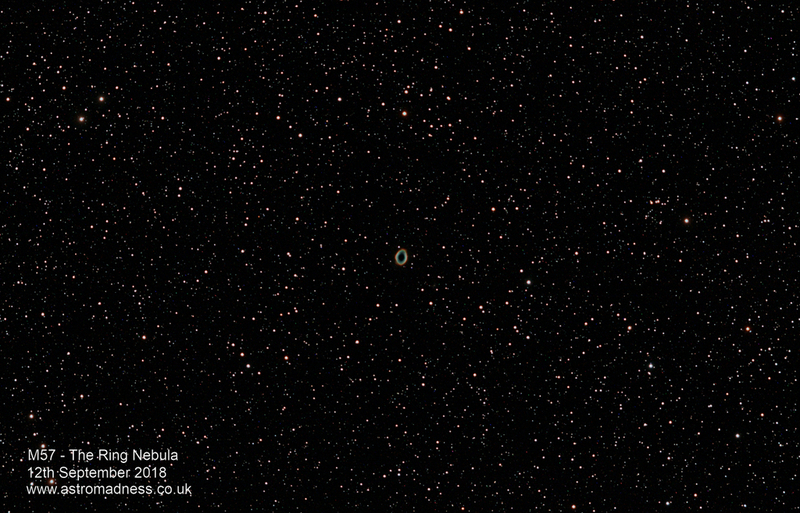 Whilst getting the screen shots for that post, I imaged M57 - The Ring Nebula. I have now had the time to go through the steps of stacking and processing the data to produce the final image. You see many images of this target because of it's apparent brightness, but more often than not, the images will be cropped or enlarged to see the Nebula in as much detail as possible. Indeed, I have done this before myself. This time however, I wanted to add a sense of scale to the image, so only cropped the image where absolutely necessary to remove the rough edges of the final image after the stacking process. Almost lost in a myriad of stars, M57 is a popular visual target. So, what of the one big learning aspect of this image in particular? Well, I have already divulged that secret! Ever since I started using the Hypercam, I have struggled with the anomaly of noise from the sensor encroaching the righe side of every image. To be clear, this in itself is perfectly normal. It is behaviour (though undesirable) of the Sony sensor used in the cameras, and it is found in every camera using that particular sensor chip. Time after time, I have been told that correct use of calibration files (darks and flats) will get rid of the noise in the final stacked image. To illustrate this noise, as well as the amp glow from the chip, here is a single 3 minutes sub frame, stretched, but not debayered. Notice the amp glow across the top and bottom edges, but in particular the additional noise on the right edge which looks like some sort of extravagant starburst effect from a bright star just out of frame. As more and more of these images are stacked up, the noise become more and more prevalent, and up until now, I have struggled to get rid of it during the stacking and calibration process. This has meant that many of my images have been significantly cropped to cut out the noise. I think I managed an imaging run once earlier this year where I successfully produce a stacked image without the noise on it, but I have failed to remember how I did it. After much more thought and reading, I understood that the dark frames should be removing this sort of anomaly, so I started wondering if I just wasn't producing enough information in the master dark file to take care of this noise. So, that left me with one option. To increase the number of dark frames I was taking. I have never found a definitive ratio for the number of light frames to dark frames to flat frames to obtain for each image. Sometimes it has been 60 light frames and 20 darks. Other times 20 light frames and 10 darks. For this image in particular, I went with the approach that if I took one dark frame for every light frame, then I would be able to experiment by changing the ratio each time. This is when I seemed to have struck gold. This is what the final stacked image looked like when PixInsight had finished the stacking process. Remember that the image has had not been cropped at this point, has had no processing done to it, but has been stretched to show the detail available. Notice that the noise and a majority of the amp glow has now been dealt with successfully, allowing me to make far better use of the whole frame, instead of cropping out any interference, and loosing about 1/3 of the image in the process. So there you go, one image and 2 stories. Now it's just a question of making sure that this is repeatable. It all come down to the fact in this instance that I simply didn't have enough dark calibration frames. All I need to do is get out there on the next clear night and repeat. I hope this helps other owners of the Altair Hypercam 183c series of cameras. I see it raised regularly in various forums and groups, but no-one as far as I can see has been able to say definitively what they do to combat the problems. Thanks for reading, and clear skies! Astrocamp XIII - Cwmdu we had no problem.